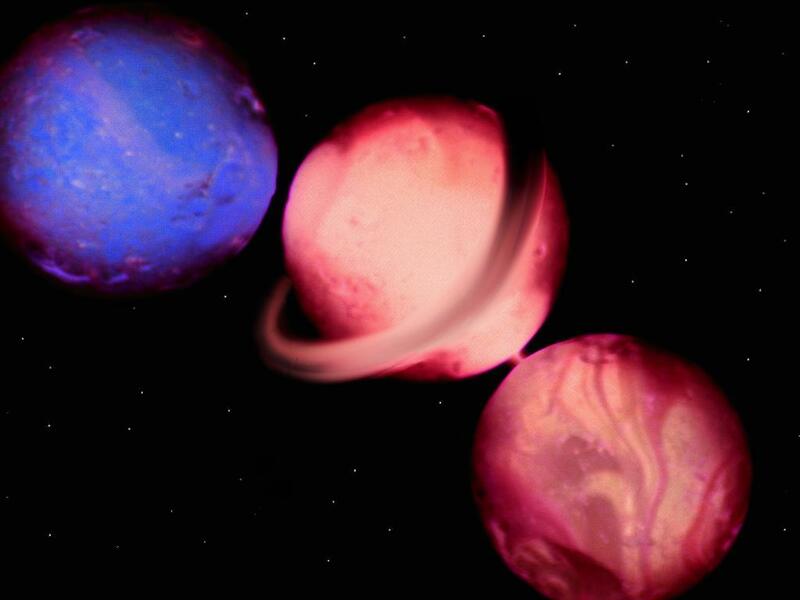 Many images of planets have been manipulated. So have we seen their true colours? Not always, it turns out. The short answer to this is “sometimes”, because some planets are genuinely quite colourful. Others are surfaced by rock that is almost entirely grey, and if you come across a picture of these looking colourful you can be pretty sure that the image has been manipulated in some way. Usually it’s a way of exaggerating subtle differences that human eyes are not good at seeing without help. Anyone who has used a smartphone to take photos has probably stumbled upon various options to exaggerate or tone down the colour. 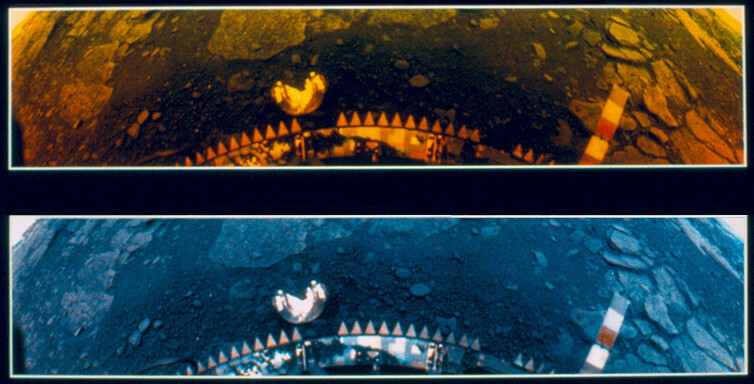 Similar techniques are routinely used for processing images sent back by spacecraft, almost always to exaggerate colour rather than to make it more subtle. But a camera on a spacecraft rarely sees colours in the same way as the human eye. For example, the red, green and blue components are usually recorded separately, transmitted to Earth as three separate black-and-white images and combined in colour only for display purposes. How the colours come out is bound to be at least subtly different from the ways your eyes would perceive the same view. What’s more, the colours on an image don’t necessarily correspond to the original colours, even if there has been no attempt to exaggerate them. In principle, a spacecraft camera can record in any part of the light spectrum. When one of the channels lies beyond the visible range, such as in ultraviolet, we still have to use either red, green or blue to display it. That means the resulting picture is “false colour”, which might then be further exaggerated. 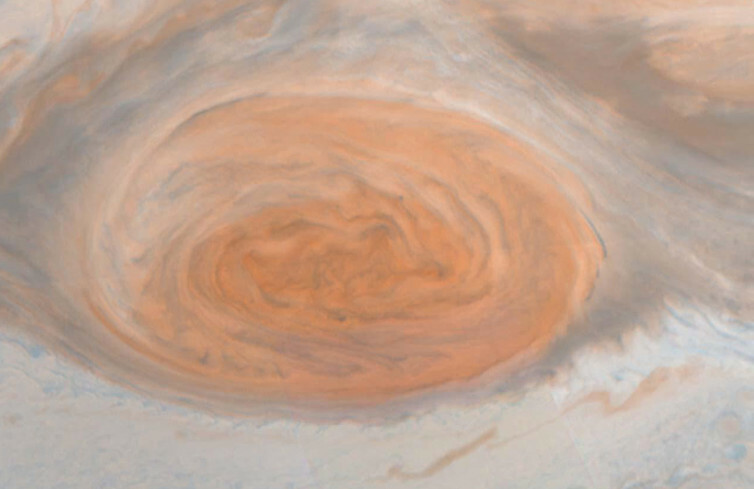 Jupiter famously has a “Great Red Spot”, a giant oval storm system. While the more subtle colours elsewhere in Jupiter’s clouds may be largely due to the cloud-tops being seen through different depths of transparent atmosphere, the clouds in the spot itself are stained red by an unknown contaminant. Candidates include phosphorous, a sulfur compound, and complex organic molecules. Jupiter’s propensity for strong colours is shared by its innermost large moon, Io. Here, frequent explosive volcanic eruptions shower the ground with sulfur and sulfur dioxide – making the globe look like a yellow pizza, scattered with black “olives” that are in reality patches of lava that are too fresh to have picked up a yellow stain yet. In contrast, the next moon out, Europa, has a surface made of frozen water. This is strongly reflective, making it bright but not very colourful. 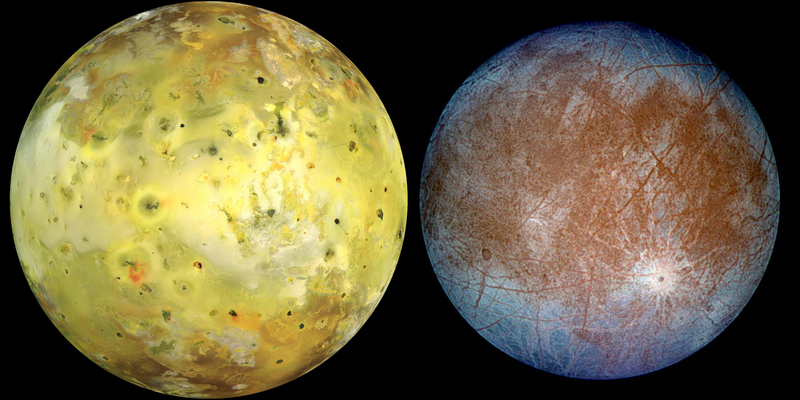 Most colour images of Europa that you are likely to come across are rendered in exaggerated and false colour. Saturn has more muted colours than Jupiter, despite having a similar atmosphere. It’s natural colour is only vaguely yellow – any pictures you see of it looking strongly coloured are either false colour or exaggerated colour. 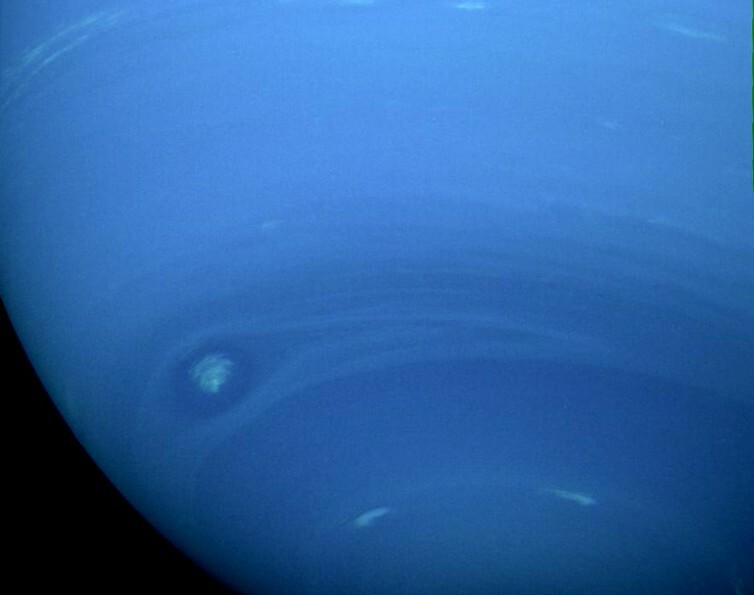 Uranus and Neptune are also hidden by an immensely deep atmosphere. 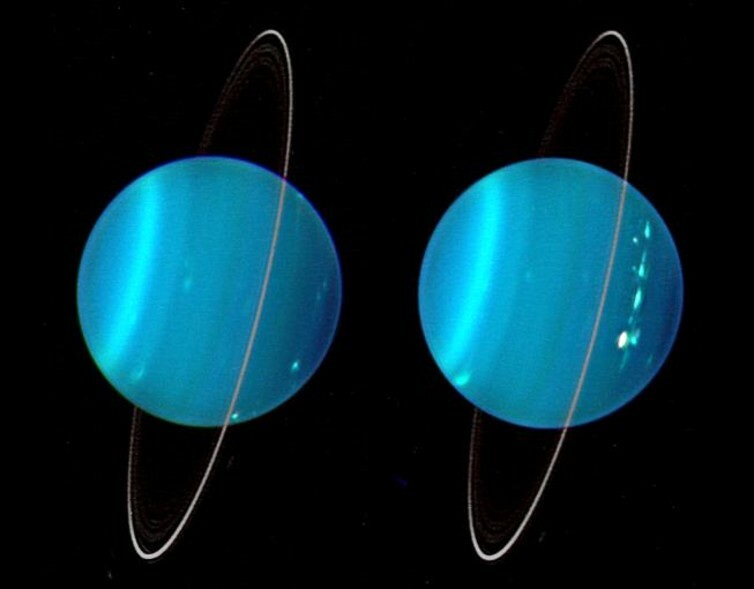 To our eyes, Uranus looks naturally green and Neptune blue, because the tops of their clouds of condensed methane are seen through a great depth of methane gas that filters out the red component of sunlight so that only green-blue light makes it down to the clouds and back out. There’s not much colour variation though; the highest clouds look white but everywhere else is blue or green. Mars is aptly referred to as “the Red Planet”. The iron in its rock and dust has largely been turned to iron oxide, or rust. Consequently, Mars looks red to the unaided eye if you see it in the sky, it looks red from orbit, and it looks red as seen by rovers on the ground. Here the debate is whether to render colours as they “really” look or as they would look if the quality of the light were the same as on Earth. 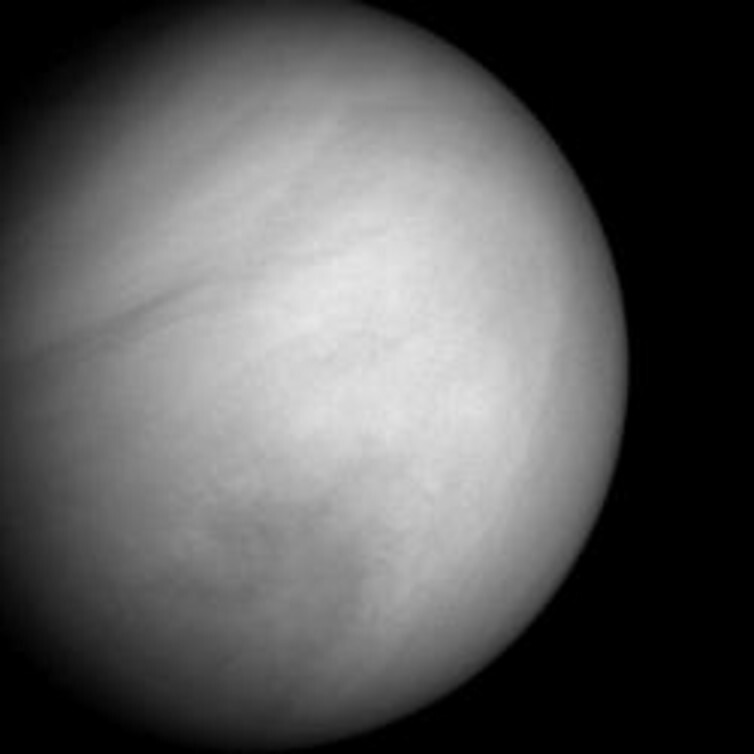 Venus is swathed in dazzlingly white clouds and the surface has been visited only by handful of Soviet landers. The dense clouds allow only a dull reddish glow to reach the ground, so everywhere looks orange. But the rocks themselves are really a drab grey kind of lava. Mercury is an airless world made of drab, dark grey rock with just a hint of redness. It reflects only about 7% of the sunlight falling on it, which is only slightly more than coal would, but it is three times closer to the sun than the Earth is, where the intense sunlight would make it look pretty bright even without adjusting the image brightness. However, to tease out the colour variations that lurk in Mercury’s landscape features, it is common practice to use false colour in a way that basically boosts the very subtle natural colour differences until they are glaringly obvious. Don’t think of this as cheating. It is revealing truths about a world that you’d be able to see if your eyes and brain had evolved there, in order to maximise the available information.